The new 2018 Porsche 911 GT2 RS, the fastest and most powerful street-legal 911 model ever, is powered by a 700-horsepower 3.8-liter twin-turbo flat-six engine mated to a customized GT seven-speed double-clutch Porsche Doppelkupplung (PDK) transmission. The two-seater accelerates from zero to 60 miles per hour in 2.7 seconds to a top track speed of 211 miles per hour, and it surpasses the 2011 911 GT2 RS by 80 horsepower. The 2018 Porsche 911 GT2 RS model is available to order with a base MSRP of $294,250 (including the $1,050 delivery, processing and handling fee). It will reach U.S. dealers in early 2018. 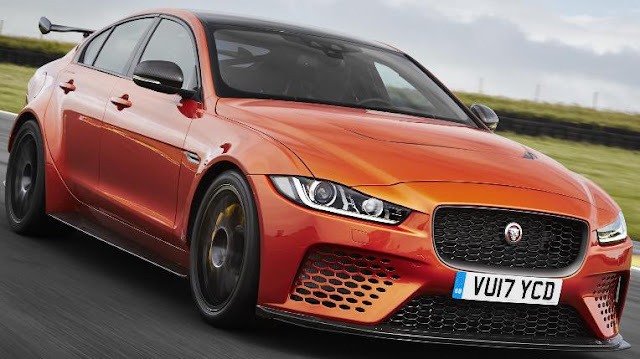 The new Jaguar XE SV Project 8, an all-wheel drive hand-built sedan available in two- and four-seat specification, is powered by a 592 horsepower 5.0-liter supercharged V8 gasoline engine mated to an eight-speed Quickshift® transmission with a top speed of 200 mph. No more than 300 will be created for global sale. The 2018 Maserati GranTurismo is powered by a 460 horsepower 4.7-liter V8 enginemated to a six-speed ZF automatic transmission. For 2018, the GranTurismo features a new, high resolution 8.4” capacitive touch screen and Harman Kardon Premium Sound system. Aston Martin RapidE, powered by an all-electric powertrain replacing the six-liter V12 engine, is based on the Rapide AMR Limited, and will enter production in 2019 with a build run of 155 cars. The all-new 2018 BMW X3, the third generation X3, is 2.2-inches longer than its predecessor and comes with a factory-installed trailer hitch. The BMW X3 xDrive30i is powered by a 248 horsepower 2.0-liter TwinPower Turbo 4-cylinder gasoline engine, 8 horsepower more than the outgoing BMW X3 xDrive28i and mated to an 8-speed Steptronic Sport transmission with shift paddles. The flagship X3 M40i has a 355 horsepower 3.0-liter M Performance TwinPower Turbo technology 6-cylinder inline engine connected to an 8-speed Steptronic Sport automatic transmission with Launch Control. The all-new 2018 BMW X3 will be available at certified BMW Centers this November with pricing to be announced closer to market launch. The all-new BMW 640i xDrive Gran Turismo is powered by 335 horsepower 3.0-liter TwinPower Turbo 6-cylinder inline gasoline engine mated to an 8-speed Steptronic Sport automatic transmission with shift paddles and will be available at showrooms in this Fall starting at $70,695 (including $995 destination and handling charge). The all-new 2018 Volkswagen Tiguan is powered by a 184 horsepower four-cylinder turbocharged and direct-injection 2.0-liter TSI engine mated to an eight-speed automatic transmission and at 185.1 inches long gains 10.6 inches in length over the existing model and features up to 58 percent more cargo space and third-row seating comes standard on FWD models, and is optional on AWD models. The all-new 2018 Tiguan will have S, SE, SEl and SEL Premium trim levels with the turbocharged 2.0L TSI® S FWD model starting at $26,245 (including $900 destination fee) and $27,545 for the 2.0L TSI S 4Motion®. The 2018 Tiguan arrives in dealerships in this Summer. The all-new 2018 Subaru Crosstrek gets a revised 152 horsepower 2.0-liter 4-cylinder Boxer engine with direct fuel injection mated to either a new 6-speed manual transmission or a Lineartronic® Continuously Variable Transmission (CVT) with a 7-speed manual mode function with steering wheel paddle shifters, offered in 2.0i base, Premium and Limited trims. The all-new 2018 Subaru Crosstrek pricing begins at just $100 over the last generation model at $22,710 (including $915 destination & delivery charge) with premium trim Crosstreks priced from $$23,510 and 2.0i Limited from $27,210. All 2018 Crosstrek models will have front driver and passenger seat side impact airbags, side curtain airbags and a driver’s knee airbag when they arrive at retailers late this Summer. The 2017 Nissan TITAN King Cab and TITAN XD King Cab models, on sale now at Nissan dealers, with a choice of 390-horsepower 5.6-liter Endurance® V8 engine mated to a 7-speed automatic transmission, or a 310 horsepower 5.0L V8 Turbo Diesel matched to a 6-speed Aisin A466ND automatic transmission, is offered in 4x4 and 4x2 drive and S, SV and PRO-4X (4x4 only) grade levels. The new King Cab with available 6-person seating offers half-ton and XD versions with a standard 6.5-foot bed length. TITAN S King Cab 4x2 starts at $33,745 (including destination and handling $1,195). TITAN XD King Cab offers an available maximum towing capacity of 12,510 pounds (diesel engine) and maximum payload capacity of 2,710 pounds (gas engine) when properly equipped. The all-new 2018 Ford Expedition FX4 Off-Road Package, with a 375 horsepower 3.5-liter EcoBoost® engine with standard Auto Start-Stop, an all-new 10-speed transmission and available towing of 9,300 pounds, is made of all-new high-strength, aluminum-alloy body and redesigned high-strength steel frame to save up to 300 pounds. Expedition’s all-new Terrain Management System™ lets FX4 customers select from seven special drive modes to adapt to different road conditions. The all-new Expedition lineup, including the FX4 Off-Road Package, goes on sale this Fall. The 2018 Cadillac XTS, powered by a 304 horsepower 3.6L V-6 engine or a 410 horsepower twin-turbo 3.6L V-6 standard on the all-wheel drive V-Sport model, receives technical, chassis and appearance changes including improved ride comfort and noise reduction, freshened front and rear fascias, new fenders, and grille. The next-generation Cadillac user experience can be adjusted over time to meet a customer’s evolving connectivity needs, leveraging the cloud to enable personalization, available connected navigation and applications via the Collection app store. The new limited-production, 840-horsepower Dodge Challenger SRT Demon starts at $86,090 (including $1,700 gas guzzler tax and $1,095 destination charge) with Demons sold at or below MSRP to receive priority scheduling resulting in lower serial numbers and Demons sold at a price that exceeds MSRP will be produced after priority production is completed. Dealers can only order as many Demons as they are allocated. The Jaguar E-PACE compact SUV, the 2nd performance SUV in the ‘PACE’ line-up, will be revealed to the world on July 13, and will go on sale beginning in early 2018 priced from $39,995 (including $995 destination/handling charge). The all-new 2018 Toyota Camry, available in L, LE, XLE, SE and XSE trim levels, powered by an all-new 206 horsepower 2.5-liter inline-four-cylinder D-4S gasoline engine and a new 301 horsepower 3.5-liter V6 with D-4S Fuel Injection, both paired to a new eight-speed Direct-Shift automatic transmission. The 2018 Camry Hybrid is available in LE, SE, and XLE with an EPA-estimated mpg of 51 city/ 53 highway/52 combined on the LE grade, a 30 percent increase for combined mpg, and 44 city/47 highway/46 combined on the SE and XLE, reflecting an increase of 21 percent for combined mpg. The MSRP for the new 2018 Toyota Camry gas models will range from $24,380 (including the delivery, processing, and handling fee of $885) for the L grade 4-cylinder to $35,835 for the Premium XSE V6. The MSRP for the Camry hybrid will range from $28,685 for the LE to $33,135 for the XLE. 2018 Lincoln Navigator, an all-new full-size SUV with three rows that's 200 pounds lighter with its aluminum-alloy body, is powered by a 450 horsepower twin-turbo V6 engine mated to a 10-speed transmission. The all-new Navigator’s cargo management system offers an adjustable shelf behind the rear seats that customized storage so when the vehicle parked on an incline groceries won’t roll out when the liftgate is opened. The all-new Navigator with six USB ports, four 12-volt power outlets and a 110-volt plug. An available wireless phone charger in the first-row center console media bin eliminates tangled cords. Navigator comes with three Lincoln Black Label options of interior design themes and materials. Genesis GV80 Concept SUV is a new fuel cell concept SUV that utilizes plug-in hydrogen fuel cell electric technology. The interior cabin has a bridge instrument panel that stretches from door to door and a wide 22-inch curved display set in the instrument panel cascades into the driver’s cluster, which combines the precision of a classic speedometer with the immersive flow of information from a digital display. 2018 Jeep® Grand Cherokee Trackhawk, powered by a 707 horsepower supercharged 6.2-liter V-8 engine mated to a TorqueFlite eight-speed automatic transmission and delivering 645 lb.-ft. of torque for a 0-60 miles per hour time of 3.5 seconds, quarter mile of 11.6 seconds to a top speed of 180 mph. Grand Cherokee Trackhawk is equipped with the Jeep Quadra-Trac on-demand four-wheel-drive system, which includes an electronic limited-slip rear differential and a single-speed active transfer case and capable of towing 7,200 pounds. Features include a five drive-mode Selec-Track system, an 8.4-standard touchscreen with Apple CarPlay and Android, AutoTrailer Hitch Camera View at Speed, which allows owners to view trailered items through the rear-mounted camera while moving, and a Valet mode. The 2018 Grand Cherokee Trackhawk will arrive in Jeep showrooms in the fourth quarter. 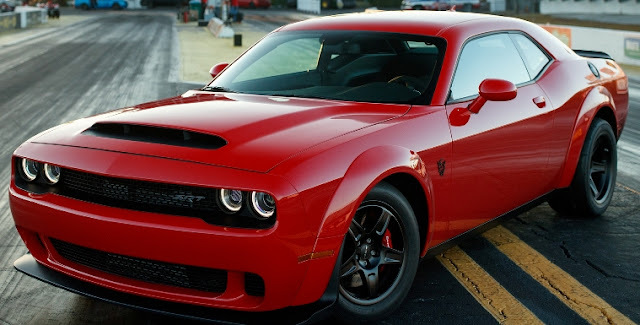 2018 Dodge Challenger SRT Demon, shown at the New York International Auto Show, is powered by an 840 horsepower supercharged 6.2-liter HEMI® Demon V-8 engine, the world’s most powerful factory-production V-8, delivering 770 pounds-feet of torque with a 1.8 g-force acceleration for a quarter-mile elapsed time of 9.65 seconds reaching 140 miles per hour. The Demon's 0-30 mph time is 1.0 second and 0-60 mph time is 2.3 seconds. The SRT Demon is first-ever, street-legal factory-production car designed to run on 100+ unleaded high-octane fuel available at select gas stations, specialty shops and drag strips. Production is limited to 3,000 in the United States and 300 in Canada with sales starting later this summer and deliveries to Dodge//SRT dealers this Fall. All customers who buy the new 2018 Dodge Challenger SRT Demon receive one full-day session at Bob Bondurant School of High-performance Driving. The Hyundai Kona, with an all-new compact SUV platform developed for the Kona, will offer a 147 horsepower 2.0-liter MPI Atkinson engine paired with a six-speed automatic transmission or the 175 horsepower Gamma 1.6T-GDI engine mated to a seven-speed dual-clutch transmission. Safety features include Forward Collision-Avoidance Assist, Lane Keeping Assist, High Beam Assist and Driver Attention Warning. The car’s radar systems also assist with the Blind-Spot Collision Warning and Rear Cross-Traffic Collison Warning. Different rear suspension systems have been developed for both 2WD and 4WD. The Kona will go on sale in Korea later this month, followed by North America and Europe.